Cloud technologies are here to stay, but not without concerns. The concerns are different for different organizations and there is no ‘one size fits all’ solution to have these concerns addressed. It is for the enterprise to come up with a cloud strategy and carefully weigh the pros and cons of cloud adoption with due consideration to the competing constraints. When not done well, this could have telling impact on the business. 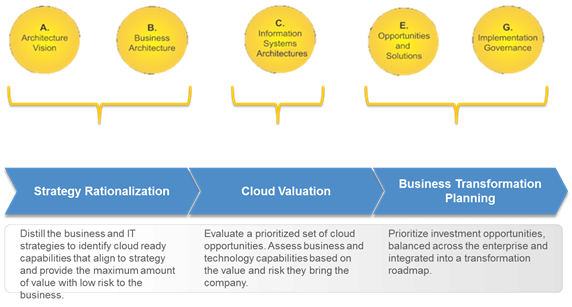 A model based approach or a framework based approach to come up with the cloud strategy could help maximize value creation out of cloud adoption. With their expertise on the standards and frameworks and on the internal business capabilities, the Enterprise Architects are in the best position to take this mantle. Though there are various standards and frameworks that can be used to strategize and plan the Cloud Adoption, Mike Walker in his article suggests a simple three step framework for Cloud Strategy and Planning, which he adopts from TOGAF and other frameworks. 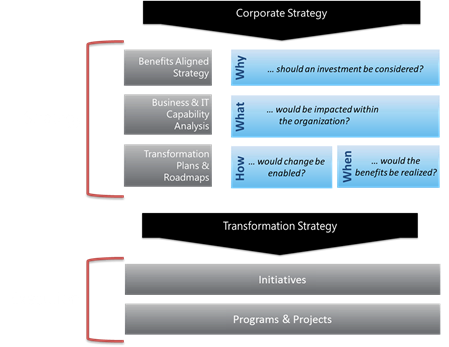 The following diagram visualizes the mapping of the TOGAF methods to the Cloud Strategy Planning Framework. 2. Set Strategic Vision - This is about understanding and coming up with a strategic vision for cloud computing in the enterprise and for the purpose, due consideration shall be given to the IT and Business strategic objectives of the organization, the cloud computing patterns and technologies and the feasibility and readiness. 3. Identify & Prioritize Capabilities - This is an important activity as it lays down the criteria for evaluating the capabilities in the form of IT and business value drivers. The outcome of this activity would be the key capabilities that are subject to further analysis. 4. Profile Capabilities - This again is a critical activity, in which the current maturity levels of the capabilities are determined and then other risks and other constraints like architectural fit, readiness, feasibility etc are assessed. 5. Recommend Deployment Patterns - Based on the capability profiling come up with recommended cloud services and the deployment patterns based on architectural fit, value and risk. Of course this will call for due consideration of the proven practices, and the industry trend. 6. Define and Prioritize Opportunities - This activity is more like coming up with a business case for an opportunity for cloud transformation and yes, this should include the perceived benefits, expected risks, technology impacts, and a detailed architecture..
7. Define Business Transformation Roamap - This activity is about performing an assessment of implementation risks and dependencies and develop a transformation roadmap, which should be validated with the business users. You may wish to check out the original article here.